On Sunday, Prime Minister Narendra Modi addressed a huge rally in Talkatora Stadium located in the national capital Delhi. There while addressing, PM Modi expressed his confidence in winning the upcoming Lok Sabha elections 2019 and also stated that watchman is not a just a job recognized by a uniform, but it is the determination behind the word. Modi interacted with people throughout the country via video conferencing amid chants of slogans ‘Main Bhi Chowkidar‘ at Talkotra Stadium. He started his conversation talking about the Balakot air strikes and said that he has complete trust in the ability and disciple of armed forces and he knows what they can achieve. He continued saying that he has tried his best to protect the nation’s wealth from the corrupt ever since he has been trusted with the responsibility to lead the nation. He said we all need to be Chowkidar to build a strong government, and also we need to work in the spirit of chowkidar to take the nation forward. Not only he addressed but, PM Modi also appreciated as well as respond to several questions sat to him by different people, supporters who attended the video-conferencing. Apart from local people residents, External Affairs Minister Sushma Swaraj, and Home Affairs Minister Rajnath Singh also attended the campaign via video-conferencing. Maharashtra Chief Minister Devendra Fadnavis, Gujarat Chief Minister Vijay Rupani, former Madhya Pradesh Chief Minister Shivraj Singh Chauhan, and Haryana Chief Minister Manohar Lal Khattar were among others who attended the campaign via video conferencing. 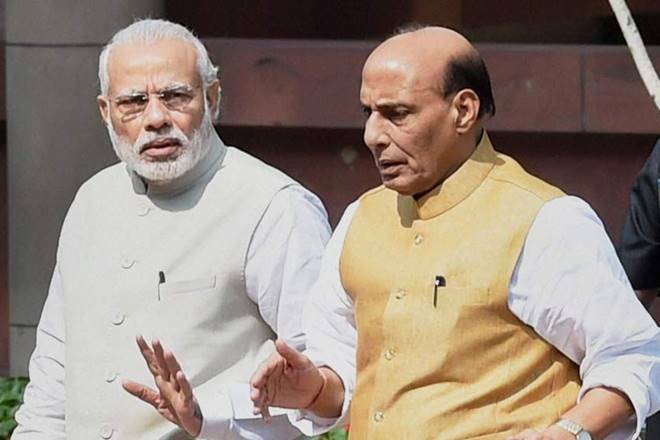 On Thursday, as disapproval in the terror attack on a CRPF convoy poured in from all quarters, the Prime Minister of India Narendra Modi promised that the “sacrifices of our brave security personnel shall not go in vain.” Likewise, Rajnath Singh, Union Home Minister of India who named Pakistan, said that a “strong reply” will surely be given. An SUV carrying 350 kg of explosives had rammed a suicide bomber into a bus carrying the CRPF soldiers in the bloodiest attack in decades on security forces in Pulwama district, Jammu and Kashmir. The attack on the Central Reserve Police Force (CRPF) convoy in Jammu & Kashmir has left almost 40 dead. In the same regard, Prime Minister who spoke to Union Home Minister and Ajit Doval(National Security Advisor) chaired a meeting of the Cabinet Committee on security at 9.15 am today. Along with the PM, the meeting was witnessed by Defence Minister Nirmala Sitharaman and Finance Minister Arun Jaitley. “Those behind the terrorist attack in Pulwama will have to pay a heavy price. The terrorists…they have made a big mistake. You will have to pay a very heavy price…I assure everyone that the forces behind the attack…we will bring them to justice. Later in the meeting, Union Minister Arun Jaitley stated that the government would take all possible diplomatic steps to assure Pakistan’s “complete isolation” and had withdrawn the ‘Most Favoured Nation’ status to the country. Also, one National Investigation Agency or NIA team of 12-members will reach today to support the Jammu and Kashmir Police in forensic evaluation of the spot. Moreover, after the meeting, Mr. Rajnath Singh will be visiting Srinagar to hold the review meetings with senior security and police officials and also to understand the situation to review besides operational actions. The Pakistan-based Jaish-e-Mohammad (JeM) took full responsibility for the attack. Prime Minister Narendra Modi arrived in Gujarat to attend the annual conference of Directors General and Inspectors General of Police. The Directors General and Inspectors General of Police Conference is an event in which top police officers from all over the country discuss and share security-related issues. First, Gujarat Chief Minister Vijay Rupani and Deputy Chief Minister Nitin Patel welcomed PM Modi at the Vadodara airport in the morning. After that, PM Modi left for the ‘Statue of Unity’ near Kevadiya in Narmada district to attend the DGPs and IGPs annual conference. The meet was organized at ‘tent-city’ set up near the 182-meter tall statue dedicated to country’s first Home Minister Sardar Vallabhbhai Patel. The three-day event began in the presence of Union Home Minister Rajnath Singh. Modi visited the Statue of Unity, the world’s tallest statue, before heading for the conference which he had unveiled on 31 October. Also, he paid floral tributes to Sardar Patel there. Also, Modi inspected the “Ek Bharat Shreshtha Bharat” parade at the Statue of Unity which was performed by Police Officials from various states. MoS Home Hansraj Ahir and Union Home Minister Rajnath Singh were also present at the occasion. Moreover, PM Modi was given Gaurd of Honour at the Statue of Unity, in Kevadiya. Further, Union Home Minister Rajnath Singh addressed the inaugural session of the conference. He said that the internal security condition of the country has vastly improved, especially in the North-East and the Left-wing extremism affected States. Also, he awarded three police stations— Campbell Bay in Andaman & Nicobar Islands, Kalu in Rajasthan and Farakka in West Bengal for their impressive performance. During the Conference of DGPs and IGPs, I’ve also got the opportunity to meet select groups of officials and discuss specific issues pertaining to policing and security. On December 22, the last day of a national convention of the party’s Mahila Morcha, PM Modi will address the BJP women’s wing workers at Trimandir, a temple complex near Adalaj village in Gandhinagar, Gujrat. Also, he will release a commemorative stamp on National Police Memorial, and will also launch the portal of the Cyber Coordination Centre at the conference. Watch Video of Full Event Here! 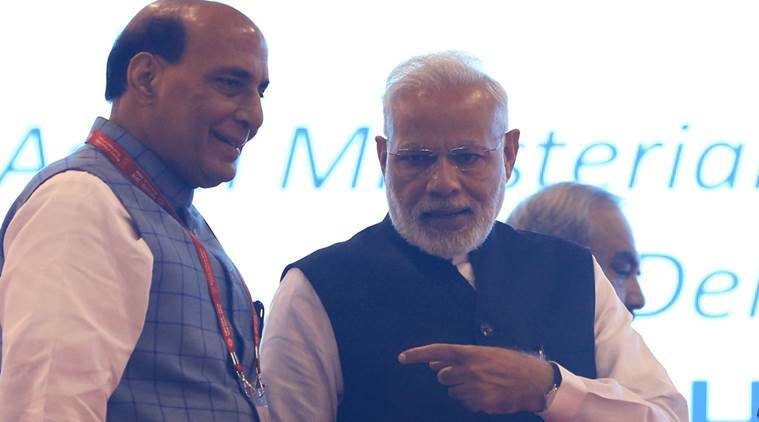 Delhi: It seems like the Union Home Minister Rajnath Singh is really concerned about the security of Prime Minister Narendra Modi. Singh held a meeting with senior officials to review the security of PM Modi, as Pune police claimed about a Maoist Plot to kill Prime Minister Modi. This plot is similar to the murder of the Prime Minister in a “Rajiv Gandhi-type incident” during one of his roadshows. The home ministry got the reports related to this matter from the Maharashtra police. Yesterday, the meeting was arranged. And along with the Union Home Minister Rajnath Singh, it was attended by the National Security Advisor ‘Ajit Doval’, the Director of the Intelligence Bureau ‘Rajiv Jain’ and the home secretary among others, the sources said. According to the home ministry, the home minister has controlled all the essential measures and discussed with other agencies to suitably strengthen the security arrangements for the Prime Minister. According to the police, the evidence of threats against PM was found in a laptop that belongs to Rona Wilson, one of the five people arrested recently over January’s caste-related violence in Maharashtra’s Bhima-Koregaon. The letter was all about planning to kill PM Modi, it addressed to one “Comrade Prakash” and was signed with the initial “R”. According to the police, the initial R means Rona Wilson. The letter was presented in court where a part of it was read out by the public prosecutor. A few more people have been arrested. They include Dalit activist Sudhir Dhawale, lawyer Surendra Gadling and activists Mahesh Raut and Shoma Sen. According to police, they are the top brass of urban Maoists. In this context, the veteran politician Sharad Pawar who is the chief of Nationalist Congress Party said that BJP was “playing the threat letter card” after realizing that they are losing popular support “to gain sympathy”. And for this statement, he got badly trolled by Chief Minister of Maharashtra Devendra Fadnavis. Also, it seems like the Congress leader Sanjay Nirupam supported the statement of Sharad Pawar and said that this news could be planted. 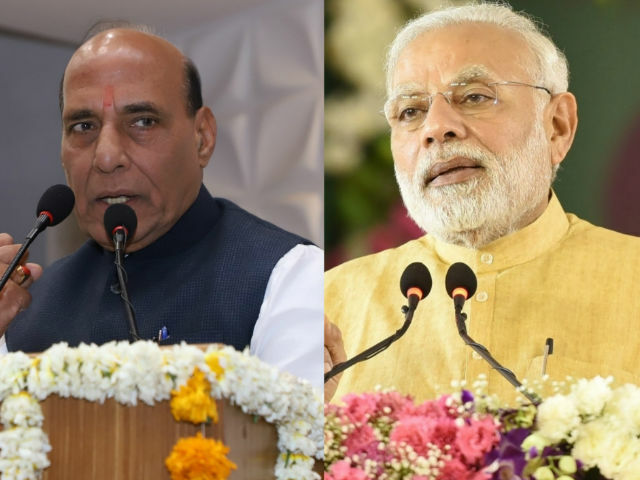 Indian Prime Minister Narendra Modi is totally disappointed with the incidents of vandalism in different parts of the country and finally spoke to Rajnath Singh to look into the matter. The close source to the minister reveals that he is extremely disappointed with the incidents of vandalism. The Home Minister Rajnath Singh said that the matter if vandalism has been reported from the country and has been taken a note on them. “Honorable Prime Minister has also spoken to the Home Minister in this regard,” the advisory said. The pulling down of Lenin’s statue in Tripura and destruction of Periyar’s statue in Tamil Nadu has strongly affected PM Modi on Wednesday, he commends these incidents in action, saying serious action will be taken against the people who will found guilty. Rajnath Singh called up Tripura Governor Tathagata Roy and DGP A K Shukla and asked them to check peace and violence until the new government is formed in the state. 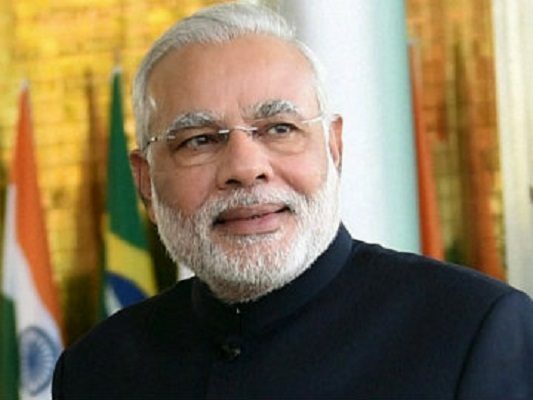 PM Narendra Modi will now greet the top police officers of the country at an event. The event will be a 3-day annual conference to be arranged by IB i.e. Intelligence Bureau at Tekanpur (Madhya Pradesh). The event will focus on the topics including some issues concerning northeast, counter-radicalization and policing in the future. During the event, it is expected that PM Modi Ji will announce the names of the top police stations in India. The survey for the same is done by Intelligence Bureau. Mr. Modi will be accompanied by Home Minister Rajnath Singh and NSA Ajit Doval in Tekanpur. While it is reported that Modi Ji will speak on new age crimes and radicalization of youth, Mr. Singh will give his evaluation of the security situation. Moreover, the action on the decisions taken at the earlier conferences will also be audit at the meeting.